Authors: Abramova A.Y., Koplik E.V., Alekseyeva I.V., Pertsov S.S. Aim. To study the effect of repeated stress on blood glucose level in rats with various behavioral characteristics and with different resistance to the development of adverse consequences of negative emotiogenic exposures. Materials and Methods. The animals were initially subjected to open field test to calculate the index of activity. Daily 4-h immobilization of rats in individual plastic cages for 8 days was used as a model of stress. Blood glucose concentration was measured with a glucometer (control measurement and on the 1st, 3rd and 8th days of repeated stress). Results. The basal level of glucose in behaviorally active (stress-resistant) rats was lower than in passive (stress-predisposed) specimens. Repeated exposure of rats to stress resulted in development of hyperglycemia. However, the dynamics of blood glucose concentration was different in specimens with different parameters of behavior. The increase in glucose concentration in active animals was most pronounced after a single exposure. By the 3rd and 8th days of stress exposures, glucose level in these rats progressively decreased (as compared to the 1st day), but remained above the basal level. Passive specimens were characterized by the increase in blood glucose concentration after a single and, particularly, after three-time restraint stress. Glucose content in these animals slightly decreased by the 8th day (as compared to the previous periods), but was above the basal level. Conclusion. The dynamics of abnormalities in carbohydrate metabolism (in particular, changes in blood glucose level) during chronic emotiogenic exposures differed in specimens with different resistance to stress factors. These data illustrate the importance of an indivi-dual approach to studying the pathophysiological mechanisms of progression and development of stress-induced disorders. repeated stress exposures, dynamics of blood glucose, behaviorally passive and active rats, individual resistance to stress. Stress condition is a complex of adaptive reactions of mammals to physical or psychological stress factors that derange homeostasis of an organism. Physiological, psychological and social research show that conflict situations inevitable in stress, are associated with summation of the autonomic and neurologic disorders that accompany emotional stress [1,2]. The evidence of disorders in physiolo-gical functions in negative emotiogenic stress considerably differs in different individuals [1,3-5]. In research on rats, open field tests are widely used to predict sensiti-vity of animals to negative consequences of exposure to stress. Behaviorally active individuals were found to show a higher survival rate in stress compared to passive rats . So, stress response to the same type of factors is differently manifested in stress-resistant and stress-predisposed individuals. This approach to study of stress and associated psychosomatic diseases seems pro-mising for development of new methods of personalized medicine [1,2]. In the modern literature a big actual material is accumulated that illustrates the character of changes in organisms of living beings on acute exposure to stress factors. Commonly occurring discrepancies in the results of different research on physiology of stress are largely conditioned by the lack of individual approach to a study of systemic mechanisms of regulation of vitally important processes in mammals . Besides, conditions of modern life are characterized by repeated exposure of humans to different stress factors. Hence, a study of the influence of repeated action of stress factors on the systemic organization of physiological functions will permit to maximally approximate experimental studies of stress to the real conditions of human life. The most urgent thing seems to be elucidation of peculiarities of an individual reaction to stress factors in individuals with a different sensitivity to stress. It is known that psychoemotional stress plays an important role in the development and subsequent progression of metabolic disorders. Disorders in glucose metabolism are a common consequence of exposure of a human organism to stressogenic factors. There are found direct relationships between stressful influences and a stable prolonged elevation of the concentration of glucose in blood commonly leading to type 2 Diabetes Mellitus [9,10]. Despite an increased interest in the processes of development of metabolic disor-ders in exposure to stress factors, many aspects of this problem are still not studied. The modern scientific literature does not consider aprobability for specificity of changes of carbohydrate metabolism in individuals with different resistance to emotiogenic factors. Variations of blood glucose level in chronic stress are studied insufficiently. The aim of our work was to study the influence of multiple stress loads on the blood glucose level of rats with different behavioral parameters and with different susceptibility to formation of negative consequences of adverse emotional factors in open-field tests. The work was conducted on 76 male rats with 255.6±2.8 g body mass. The work was carried out in accordance with «Rules of Works with Experimental Animals» approved by the meeting of Ethic Commission of P.K. Anokhin Research Institute of Normal Physiology (Protocol №1 of September 3, 2005) and the requirements of World Society for Protection of Animals (WSPA) and of European Convention for Protection of Experimental Animals. The animals were kept in cages (4-5 animals in each) at 20-22°C on a standard food ration under artificial illumination (9:00-21:00 – light, 21:00-9:00 – darkness). After delivery to the laboratory the rats underwent adaptation to the laboratory conditions within 5 days. The animals were daily subject to handling procedure – they were repeatedly taken into the hands for 15 minutes – to prevent a stress response to being taken by the experimenter’s hands. The animals’ behavior was preliminarily studied in open field test within 3 min . The activity index was determined by division of the sum of crossed peripheral and central squares and peripheral and central upright postures of the test objects by the sum of latent periods of the 1st movement and of coming into the center of experimental camera. Depending on the parameters of open-field behavior, the animals were divided to passive (n=40, mean activity index – 0.44±0.02) and active specimens (n=36, mean activity index – 2.73±0.55). The rats were subject to a daily 4-hour immobilization stress in individual plastic restrainers at the same time of the day (10:00-14:00). Concentration of blood glucose was determined with a glucometer (Contour TS, Bayer) in control, and also on the 1st, 3rd and 8th days of repeated immobilization. Earlier it was found by us that variations of some physiological parameters in rats in this model of stress load become evident just in these periods of repeated exposures to stress [11,12]. In selection of the observation periods we were also guided by the information that the most serious physiological disorders in animals occur at the end of the alarm stage (38-40 hours after emo-tiogenic stress load),while at the beginning of resistance stage (the 4th day) and in 7 days after exposure signs of compensatory reactions are clearly seen [13,14]. The results of the experiment were processed using Statistica 10.0 and Microsoft Office Excel 2010 program packages. Since the distribution of the obtained values differed from normal, the differences bet-ween variables were analyzed using Friedman ANOVA criterion. For analysis of statistically significant differences between variation series a posteriori analysis was conducted using Wilcoxon matched pairs test with subsequent FDR-control of family-wise error rate. In control conditions, the content of glucose in blood of behaviorally active rats was lower than in passive specimens (by 7.6%, p<0.05; Fig. 1). In passive animals increased concentration of blood glucose was found after a single immobilization stress (by 6.8%) and especially after 3-time stress (by 16.0%, p<0.05 as compared to control). By the 8th day of repeated stress loads the blood glucose level in these rats decreased as compared to the preceding periods, but remained above the basal level. Changes in the content of glucose in behaviorally active specimens in the dynamics of repeated exposures to stress differed from those in passive rats. Statistically significant increase in this parameter in active animals – by 20.2% as compared to control (p<0.05; Fig. 1) – was found as early as after a single immobilization. The blood glucose level in these rats decreased by the 3rd and 8th day of repeated exposures to stress in comparison with the 1st day of the experiment, but remained above the basal level. It is important that on the 3rd day of observation this parameter in active rats was 13.0% lower than in passive rats (p<0.05). Thus, our experiments revealed differences in the basal level of blood glucose in rats with different behavioral parameters in open field test. The obtained data considerably widen the knowledge of peculiarities of parameters of carbohydrate metabolism. In particular, it was found that expression of glucose transporters (GLUT) that mediate transfer of glucose across the hematoencephalic barrier to neurons and glial tissue, largely depend on the gender and age of the animals . We found that repeated stress loads in animals in the form of 4-hour daily immobilization led to hyperglycemia. This fact supplements the results of our previous experiments that demonstrated the pattern of variations in the blood glucose level in rats with different behavioral activity after acute stress loads of 1-hour immobilization . To note, the modern scientific literature gives the data of the character of influence of stress loads on carbohydrate metabolism in mammals. For example, it was demonstrated that in mice an acute stress in the form of unavoidable electrodermal stimulation leads to a persistent increase in blood glucose level in tests for tolerance to glucose and insulin, with the accompanying frustration of the processes of insulin signaling in the liver . In the experiments on rats exposed to stress of «foot-shock» stimulation, increase in the level of corticosterone in blood was revealed accompanied by increase in glucose level . Besides, it was found that exposure to stress in the form of 15 min forced swimming resulted in a mismatch between regional blood flow and speed of glucose utilization in some structures of the brain . It is known that stress loads of different duration and intensity produce specific influences on parameters of metabolism. In parti-cular, a dependence is revealed between the blood glucose profile and duration of application of a stressful factor. In was shown in experiments on mice that immobilization within 30 minutes or 1 hour is accompanied by an evident increase in the concentration of glucose in blood . However, the glucoselevel remains unchanged even in 2-hour or4-hour immobilization stress. Some authors believe that metabolic disorders are more pronounced in acute stress than in chronic emotiogenic loads . Most researchers hold to the opinion that chronic exposures to stress factors also induce significant disorders in carbohydrate metabolism in mammals. It was found that modeling of a chronic unpredictable stress in rats within 28 days leads to increase in the level of insulin, to frustration of tolerance to glucose and to increase in the concentration of corticosteroids in blood serum. The given biochemical profile persists in the period of recovery after stress loads despite the recovered basal concentration of corticosteroids. Disorder in tolerance to glucose in these conditions is one of etiological factors for development of type 2 diabetes mellitus, or of the so called metabolic syndrome . In observations on people it was found that formation of metabolic syndrome is accompanied by evident psychoneuroimmune disorders including psychological distress, dysfunction of the autonomic nervous system and the immune system . The evidence of metabolic disorders in a long-standing stress may differ depending on the force and/or frequency of application of a stressogenic factor . In particular, reduction in the increment of body mass in rats was detected in the initial stages of a chronic intermittent stress of moderate intensity, but not in the subsequent periods of stress. Tolerance to glucose remained unchanged in these conditions of negative emotiogenic influence. There exist different views on the pathological mechanisms underlying the metabolic effects of stress. In particular, it is believed that these effects are associated with a change in the activity of renin-angiotensin system. It was found in experiments on mice that block of angiotensin II receptors diminishes expressiveness of insulin resistance in 2-week exposure to stress in the form of periodical immobilization . The majority of authors believe that glucocorticoids actively released in stress, not only influence synaptic plasticity, but also derange metabolism of glucose in the brain and reduce sensitivity to insulin. Here, many post stress disorders are associated with alteration in the activity of the main enzymes of metabolism and with the reduction of sensitivity of insulin receptors in the CNS . A role of some central peptides in development of stress-induced metabolic syndrome is shown. For example, hypothalamic neuropeptide orexin plays a key role in prevention of formation of a «pathological circle» between depressive behavior and derangement of glucose metabo-lism in a chronic stress in mice . Besides, experiments on rats demonstrated that variations of blood glucose level in a chronic stress may be attributed to peculiarities of absorption processes in the intestine and also to alteration of the activity of digestive enzymes – maltase, saccharase and lactase . In our experiments we first discovered specificity of alteration of the parameters of glucose metabolism in animals with different types of open field behavior and with different resistance to negative consequences of stress. In passive rats predisposed to negative emotiogenic loads, elevation of blood glucose level was most significant on the 3rd day of the daily 4-hour immobilization. In contrast, in active rats resistant to extreme influences, hyperglycemia was most expressed after a single exposure to stress. Concentration of glucose in blood of behaviorally active and passive specimens insignificantly declined by the 8th day of repeated stress loads (in comparison with that in the previous periods), but remained above the initial value. The obtained results expand the existing views on the specificity of metabolism of mammals in different conditions. Earlier, gender peculiarities of the consequences of a chronic and acute stress as of one the main etiological factors inducing a metabolic syndrome, were characterized. In particular, it has been discovered that changes of some biochemical parameters of blood in male rats – content of glucose, R-reactive protein, uric acid and cholesterol – are more significant in an acute than in chronic stress. The opposite results were obtained in experiments on female rats . Recently a new model of a chronic psychosocial stress has been developed . It was found that in these experimental conditions «dominant» mice (judging by behavior) were characterized by a normal metabolic phenotype, while «subordinate» specimens were predisposed to disorders in metabolism. It was found that specificity of functional relationships that determine sensitivity to insulin and maintain constant level of glucose and lipids, makes a contribution to the peculiarities of metabolic processes in these animals. The results of our experiments indicate that the dynamics of disorders of carbohydrate metabolism in repeated stress, in particular, the blood glucose level, is different in specimens with different parameters of behavior and with different sensitivity to negative emiotiogenic factors. Thus, the animals with different parameters of open field behavior having different sensitivity to adverse consequences of negative emotiogenic loads, are characterized by a number of peculiarities of carbohydrate metabolism. In the conditions of physiological norm, the content of glucose in blood of behaviorally active rats resistant to stress exposure, is lower than in passive specimens predisposed to stress. It was found that repeated stress loads in rats in the form of 4-hour daily immobilization were accompanied by hyperglycemia. However, in these conditions the dynamics of concentration of glucose in blood is different in animals with different characteristics of behavior. In active specimens an increase in the blood glucose level was most expressed after a single immobilization, and in passive rats – on the 3rd day of chronic stress. By the end of observation – the 8th day – the analyzed parameter remained above the basal level both in behaviorally passive, and in behaviorally active animals. The data presented by us indicate the necessity for individual approach to study of mechanisms of initiation and development of post stress disorders of physiological functions. Sudakov SK, Anokhin KV. Izbrannyye trudy. Vol. 3. Emotsii i emotsional’nyy stress. Moscow; 2012. (In Russ). Pertsov SS. Behavior of rats kept under conditions of a shifted light/dark regimen and receiving melatonin. 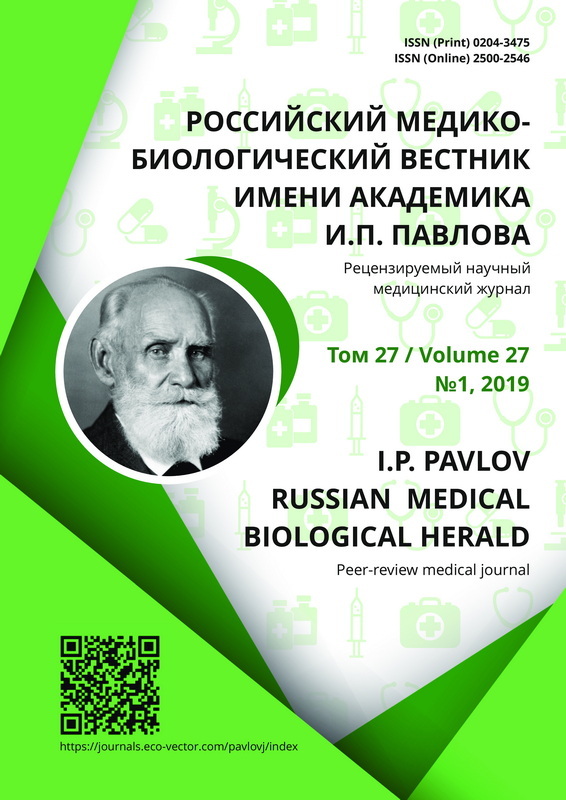 Russian Journal of Physiology. 2005;91(7): 802-9. (In Russ). Hyland NP, O'Mahony SM, O'Malley D, et al. Early-life stress selectively affects gastrointestinal but not behavioral responses in a genetic model of brain-gut axis dysfunction. Neurogastroenterology & Motility. 2015;27(1):105-13. doi: 10.1111/nmo.12486. Novykh Meditsinskikh Tekhnologiy. 2002;9(1):16-8. (In Russ). Sudakov KV, Kotov AV, Pertsov SS. Eksperimen-tal'nye podkhody k individual'noy meditsine: zavi-simost' effektov farmakologicheskogo vozdeystviya ot kharaktera povedeniya zhivotnykh. Vestnik Ural'skoy Meditsinskoy Akademicheskoy Nauki. 2004;1:51-7. (In Russ). Pertsov SS, Koplik EV, Kalinichenko LS, et al. Effect of melatonin on lipid peroxidation in the blood of rats with various behavioral characteristics during acute emotional stress. Russian Journal of Physiology. 2014;100(6):759-66. (In Russ). Egede LE, Dismuke CE. Serious Psychological Distress and Diabetes: A Review of the Literature. Current Psychiatry Reports. 2012;14(1):15-22. doi: 10.1007/s11920-011-0240-0. Joshi SK, Shrestha S. Diabetes mellitus: A review of its associations with different environmental factors. Kathmandu University Medical Journal. 2010; 8(29):109-15. doi: 10.3126/kumj.v8i1.3233. Kozlov AIu, Abramova AIu, Tsatrian VV, et al. Melatonin impact on rats' nociceptive sensitivity in case of the immune status change after lipopolysaccharide treatment. Russian Journal of Pain. 2013; 4:8-11. (In Russ). Pertsov SS, Grigorchuk OS, Koplik EV, et al. Sostoyanie organov-markerov stressa u krys s raznoy povedencheskoy aktivnost’yu pri mnogokratnykh stressornykh vozdeystviyakh. Bulletin of Experimental Biology and Medicine. 2015;160(7):25-9. (In Russ). Vyborova IS, Handgav Udval, Vasilyeva LS, et al. The hepatical structure in the dynamics of the immobilization stress. Siberian Medical Journal (Irkutsk). 2005;52(3):30-3. (In Russ). Serikov VS, Lyashev YuD. The influence of melatonin on lipid peroxidation and antioxidant enzymes activity during multiply repetitive stress actions. Russian Journal of Physiology. 2013;99(11): 1294-9. (In Russ). Kelly SD, Harrell CS, Neigh GN. Chronic Stress Modulates Regional Cerebral Glucose Transporter Expression in an Age-Specific and Sexually-Dimorphic Manner. Physiology & Behavior. 2014; 126:39-49. doi: 10.1016/j.physbeh.2013.12.002. Kalinichenko LS, Pertsov SS, Koplik EV. Uroven' glyukozy v krovi krys s raznoy ustoychivost'yu k stressornym nagruzkam: effekty tsitokinov. Byulle-ten' Severnogo Gosudarstvennogo Meditsinskogo Universiteta. 2013;1(30):117-8. (In Russ). Li L, Li X, Zhou W, et al. Acute psychological stress results in the rapid development of insulin resistance. Journal of Endocrinology. 2013;217(2): 175-84. doi: 10.1530/JOE-12-0559. Kameno Y, Suzuki K, Takagai S, et al. Mismatch in cerebral blood flow and glucose metabolism after the forced swim stress in rats. Acta Neuro-psychiatrica. 2016;28(6):352-6. doi: 10.1017/neu-.2016.24. blood glucose level induced by immobilization stress. Archives of Pharmacal Research. 2015; 38(5):921-9. doi: 10.1007/s12272-014-0430-5. Rostamkhani F, Zardooz H, Zahediasl S, et al. Comparison of the effects of acute and chronic psychological stress on metabolic features in rats. Journal of Zhejiang University – SCIENCE B (Biomedicine & Biotechnology). 2012;13(11):904-12. doi: 10.1631/jzus.B1100383. Thompson AK, Fourman S, Packard AE, et al. Metabolic consequences of chronic intermittent mild stress exposure. Physiology & Behavior. 2015;150: 24-30. doi: 10.1016/j.physbeh.2015.02.038. Hayashi M, Takeshita K, Uchida Y, et al. Angiotensin II Receptor Blocker Ameliorates Stress-Induced Adipose Tissue Inflammation and Insulin Resistance. PLoS One. 2014;9(12):e116163. doi: 10.1371/journal.pone.0116163. Detka J, Kurek A, Basta-Kaim A, et al. Neuroendocrine link between stress, depression and diabetes. Pharmacological Reports. 2013;65(6):1591-600. Tsuneki H, Tokai E, Sugawara C, et al. Hypothalamic orexin prevents hepatic insulin resistance induced by social defeat stress in mice. Neuropeptides. 2013;47(3):213-9. doi: 10.1016/j.npep.2013.02.002. of chronic social defeat stress on digestive system functioning in rats. Journal of Nutritional Science and Vitaminology (Tokyo). 2015;61(3):280-4. doi: 10.3177/jnsv.61.280. Balog M, Mlinarević D, Šerić V, et al. Plasma content of glucose, C-reactive protein, uric acid and cholesterol in male, female and ovariectomized rats upon acute and chronic stress – a path for development of cardiovascular diseases. Collegium Antropologicum. 2015;39(2):385-92. Copyright (c) 2019 Abramova A.Y., Koplik E.V., Alekseyeva I.V., Pertsov S.S.